Husband and Wife are arrested on Burglary and Drug charges after allegedly robbing a gas station in Galloway. 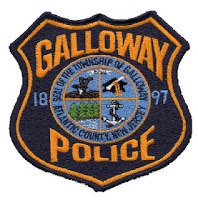 According to Galloway Police, at approximately 7:59 PM on August 3, 2013, Galloway Township Police responded to The Atlantic Fuel Gas Station in reference to the report of a male who attacked the gas attendant and stole approximately $900 cash. Through an initial investigation by Officer Jacqueline Crocker and Officer Matthew Worth, Galloway Police were able to identify the male suspect as Jesse Lacey, 30 years old of Little Egg Harbor, NJ. Police were also able to identify Lacey’s wife, Brittany Benedetto-Lacey, as the getaway driver and identify the vehicle they used in the robbery. Approximately 2 hours later Detective Ryan Goehringer and Officer Ronald Gorneau located the suspects in their vehicle at The Taffy Motel in Absecon. With assistance from The Absecon Police Department Jesse Lacey and Brittany Benedetto-Lacey were taken into custody without incident. Jesse Lacey was charged with burglary, possession of drug paraphernalia, possession of a hypodermic needle, and possession of heroin, cocaine, and crack cocaine. He was lodged in The Atlantic County Justice Facility on $75,000 bail. Brittany Benedetto-Lacey was charged with conspiracy to commit burglary, possession of drug paraphernalia, possession of a hypodermic needle, and possession of heroin, cocaine, and crack cocaine. She was lodged in The Atlantic County Justice Facility on $50,000 bail.